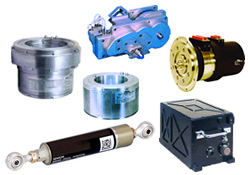 Tamagawa Seiki, since its foundation, has taken up the challenge of angular precision for control equipment, such as high-precision sensors, motors and gyros, and successfully delivered such equipment to its customers. Currently, the Company is one of the few makers in the world with the capability to develop and manufacture both two-dimensional and three-dimensional (spatial) position/angle sensors. The Company has applied leading-edge high-precision sensor technology to its "Motion System",whose fields of application are extending even to the space industry.